Donkey Kong was originally the highly popular flagship title of the SNES that was eventually transferred to more powerful systems such as the Nintendo 64 and even the Nintendo GameCube with the characters today still making cameo appearances in other Nintendo titles. 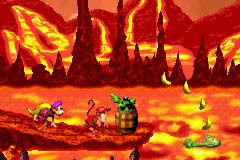 Fortunately for GameBoy Advance owners, the saga continues in Donkey Kong Country 2, one of the most addictive side-scrolling arcade games of all time which once again proves that if it isn't broke than don't fix it. The story revolves around Diddy and Dixie Kong who must now venture into the unknown to rescue one of their beloved companions. When the insidious Kaptain K. Rool and his band of creepy cutthroats kidnap Donkey Kong, it's up to Diddy and his girlfriend Dixie to rescue Donkey Kong by traversing Crocodile Isle in some of the most exciting gameplay to ever hit the GameBoy Advance. 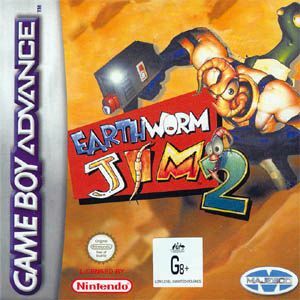 Gamers have the choice of playing a variety modes of play that includes playing both Diddy and Dixie Kong to help rescue Donkey Kong, challenging friends in the Diddy's Dash, Funky's Flying and Bag a Bug and even hooking up two GameBoy Advanced for some great multiplayer excitement. Although the mini-games are extremely entertaining, this review will focus on the main quest of the title which is playing as Diddy and Dixie Kong. The game starts with a very amusing in-game introduction that sees our former hero called Donkey Kong being kidnapped by the insidious Kaptain K. Rool and his nasty cutthroats called the Kremlings. Once the gamer has dispensed with the pleasantries, it's up to the player to start their journey and fight their way through a plethora of different enemies in order to rescue their hero. The game starts on the decks of Gangplank alley where you can control either Diddy or Dixie Kong. 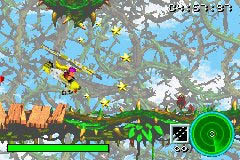 However, in order to successfully finish the title, the player must control both Diddy and Dixie who both have different abilities such as Diddy's cartwheel attack and Dixie's helicopter spin that can also be used to fly. 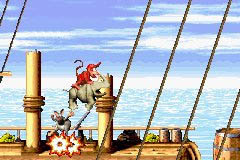 The gameplay of the title features the traditional run and jump activities where you must either defeat your foes by helicopter spins, cartwheel attacks, jump on their heads or use in-game equipment such as barrels and rhinos. Fortunately the developers have ensured that the gaming environment is quite diverse and although you start off on a pirate ship, you eventually make your way to more dangerous areas in the game such as the volcano isles. The game also contains a variety of mini-games and shops in the title that helps you with your quests and of course, collect enough bananas and you will soon earn yourself a free life. Graphically, Donkey Kong Country 2 is a visual treat on the GameBoy Advance and contains some extremely well animated characters, some beautiful gaming environments and even some special effects that not only made this title one addictive experience but one enjoyable experience. The musical score of the title features the traditional Donkey Kong Country theme that has been modified for this current incarnation and match that with some cool/cute sound effects and you have a title made in gaming heaven. In conclusion, Donkey Kong Country 2 was a brilliant game that I would recommend to all lovers of arcade side-scrolling platformers that not only took me back to the mid eighties but also gives gamers of today (for instance... my seven year old nephew) some of the most innocent and exciting gameplay for quite some time.